1 of 11 Heat oven to 325 degrees F. Coat an 8-1/2-inch springform pan and a 6-1/2-inch springform pan with nonstick vegetable-oil cooking spray. 2 of 11 Prepare cake according to package directions, filling each prepared springform pan halfway. 3 of 11 Bake in 325 degree F oven for 45 to 50 minutes or until wooden pick inserted in centers comes out clean. Let cakes cool in pans on wire rack for 10 minutes. Remove sides of pans; let cool completely. Trim cake tops even. Invert larger cake, trimmed side down, onto platter. 4 of 11 Frost larger cake layer with 1 cup frosting. Place smaller layer, trimmed side down, on top. Frost with remaining frosting. 5 of 11 Measure and cut 2 strips of parchment or waxed paper, each 13-1/2 x 2 inches, and two more strips, each 11 x 2-1/2 inches. Evenly distribute the white morsels, flat bottoms down, over the 4 paper strips. Microwave on HIGH for 50 to 60 seconds or until chips melt slightly and stick to paper. Carefully transfer paper strips to a baking sheet; refrigerate until firm and set, about 15 minutes. 6 of 11 Meanwhile, melt semisweet chocolate on HIGH power for 2-1/2 to 3 minutes; stir until completely melted and fluid. Let cool to almost room temperature, but still relatively fluid. 7 of 11 Carefully pour one-quarter of liquid semisweet chocolate over one of the paper strips, using a pastry brush to spread all the way to the edges and cover the white morsels. Repeat with remaining chocolate and the remaining three paper strips. Refrigerate for 2 to 3 minutes to firm slightly, but strips should still be bendable. 8 of 11 Carefully pick up one of the larger strips by the corners, and stick chocolate side of paper to side of bottom cake layer, lining paper up with bottom edge. Repeat with second large strip on opposite side of bottom cake layer. Repeat with shorter strips around top cake layer. (If strips are too firm so they cant be bent, place in 200 degree F oven for 2 minutes; cool to room temperature.) Refrigerate cake with strips on sides 20 minutes. Peel off paper. 9 of 11 Meanwhile, prepare chocolate leaves. 10 of 11 To serve, let cake stand at room temperature 1 hour. 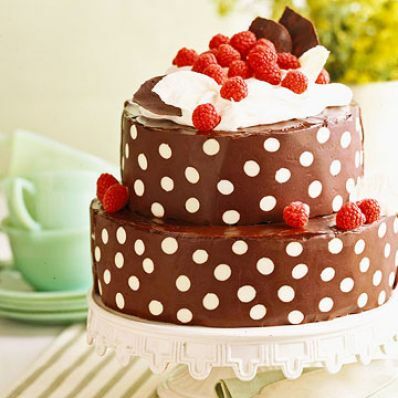 Then decorate cake with whipped cream, chocolate leaves and raspberries. Cut with long knife warmed under running hot water and dried. 11 of 11 Chocolate Leaves: Wash, drain 12 large mint leaves, and pat dry with paper toweling. Melt 2 tablespoons semisweet chocolate morsels and 3/4 teaspoon solid-vegetable shortening in small heavy saucepan over low heat, stirring, until smooth. Repeat in a second saucepan, using 2 tablespoons white chocolate baking morsels and 3/4 teaspoon shortening. Brush tops of 6 of the leaves with semisweet chocolate, and tops of remaining 6 with white chocolate. If chocolate hardens in pans, return to low heat, stirring. Set leaves aside to harden. Recoat. Carefully peel leaves from chocolate. Refrigerate until ready to use.